Today is Monday and while the sun is shining, a cold wind is whipping through the air. And it is making me feel very cold! 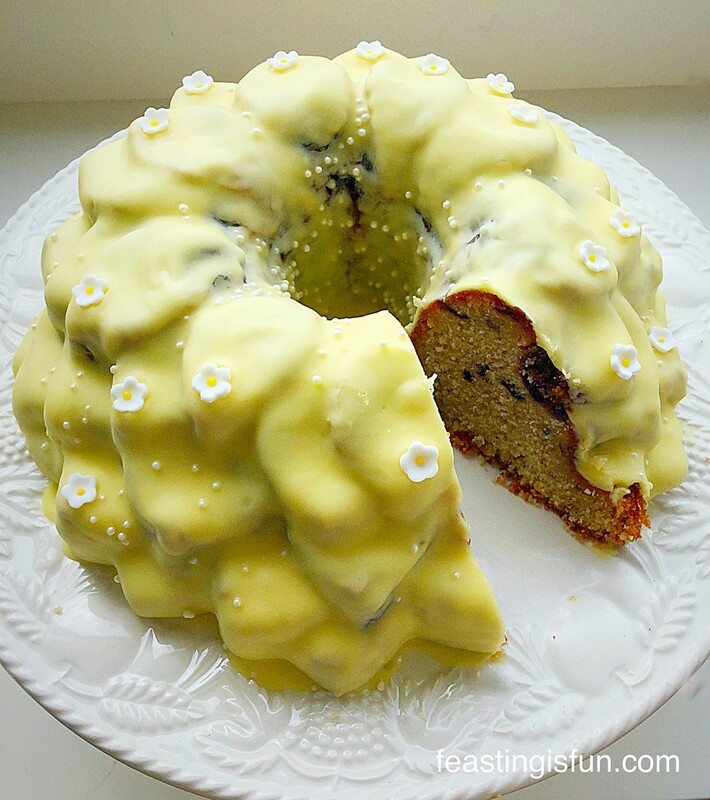 So I am making this Lemon Blueberry Bundt Cake to cheer us all up on chilly days. I absolutely adore the combination of lemon and blueberries together, in fact my Lemon Blueberry Cupcakes are one of my favourite recipes. 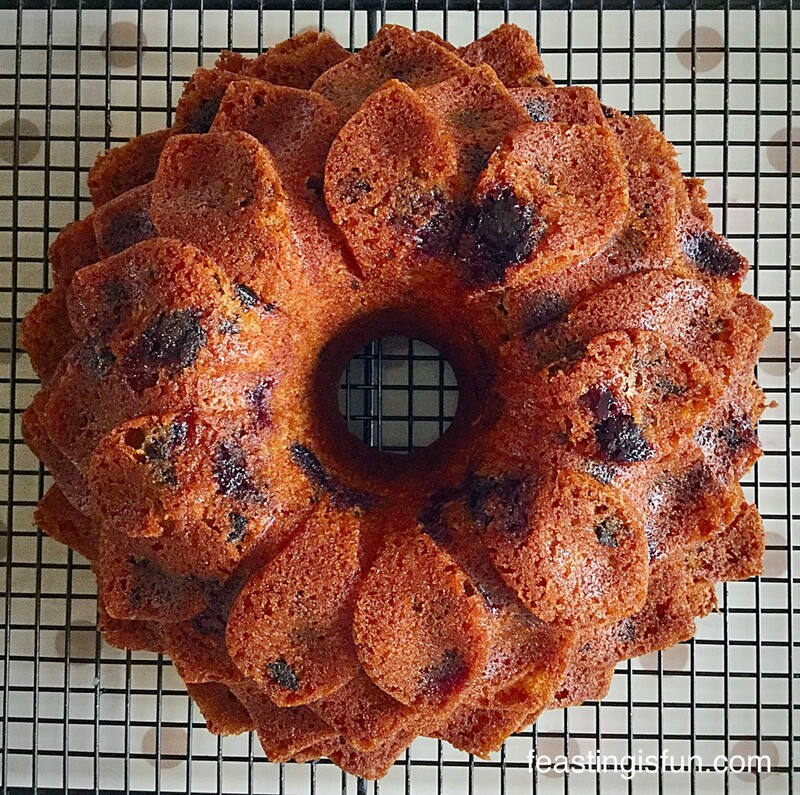 Because this Bundt cake has blueberries whisked into the cake batter, the finished cake is deliciously moist. Also I saved a few whole blueberries and added them to the batter. Resulting in little pods of blueberry jam throughout the baked cake. What I hadn’t bargained for was, the extra moistness the broken blueberries would add to this cake. And plenty of fresh lemon zest added means this Lemon Blueberry Bundt Cake delivers moist, flavourful, cake perfection, in every bite! Lemon Blueberry Bundt Cake every bite is utterly delicious. 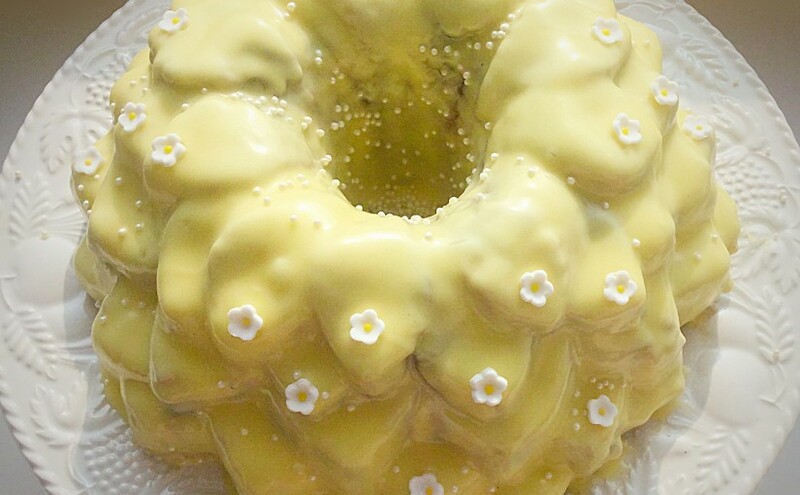 Since baking the beautiful Flower Vanilla Bundt Cake for little baby Florrie and her mum, I wanted to make another cake with a sunny, Spring theme. 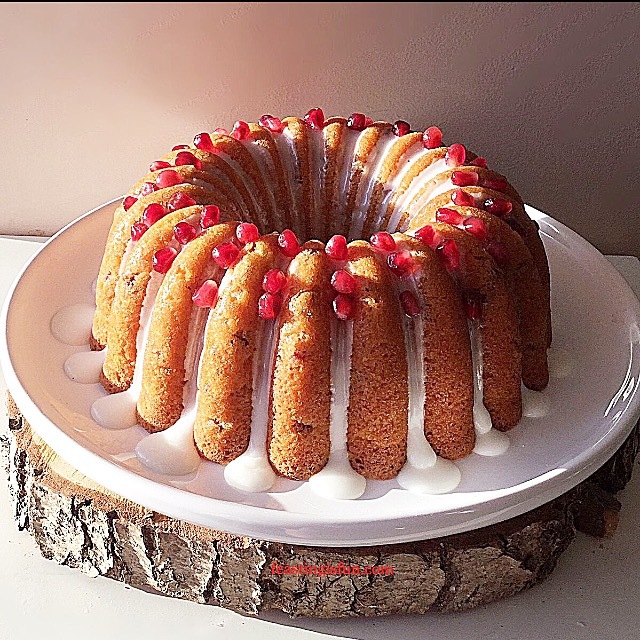 So I chose my Blossom Bundt by Nordic Ware and set about creating the recipe. I always prefer to use lemon zest in a cake, as it imparts a wonderful, zingy, lemon flavour. And the lemon juice, from the zested lemons, has its own starring role. Added to icing sugar to form the glaze for this cake, it is the first taste to hit your tongue as you bite into this cake, jolting your tastebuds awake! Lemon Blueberry Bundt Cake after one slice you’ll be coming back for more! Bundt tins are a great investment, especially if you aren’t very confident with your cake decorating skills. These beautifully shaped tins do all the work for you. This Lemon Blueberry Bundt Cake would still have looked pretty and tasted delicious with a light dusting of icing sugar. With a little care and proper preparation a Bundt tin will give you years of beautiful cakes, with no extra effort required by the baker. Although that doesn’t mean you can’t choose to decorate them. Since this is the first Bundt cake that I have fully glazed with a thicker icing and little sugar paste flowers. 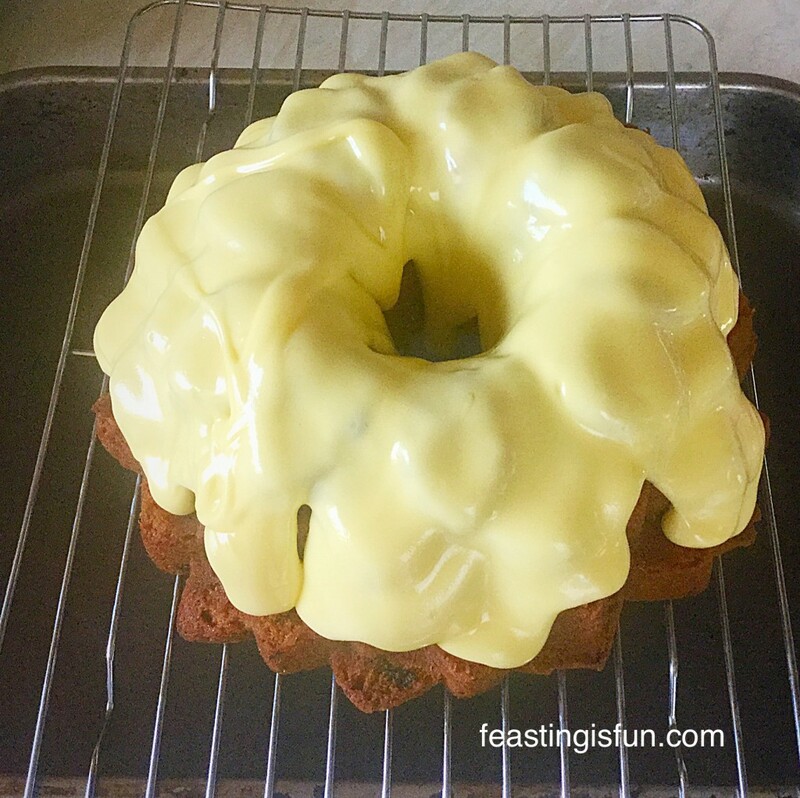 Alternatively my Glazed Lemon Bundt Cake is fully glazed, with a thinner, lighter icing and is also completely delicious. While I knew I would need a thicker icing to cover the dark blueberries near the surface of the cake. Yet I hadn’t envisaged the thickness of the icing, along with it’s pretty yellow colour, actually looked just like custard as I was spooning it onto the cake!! We all had a giggle at the similarity – that’s what baking and experimenting with decorating is all about for me. Fun! Let’s get on with making this cake! Apperiels, white pre made sugar flowers – these are readily available in supermarkets and online. First of all, into a large bowl add the sugar, butter and vanilla extract. Into a separate bowl sift the flour, baking powder and salt together (dry ingredients). 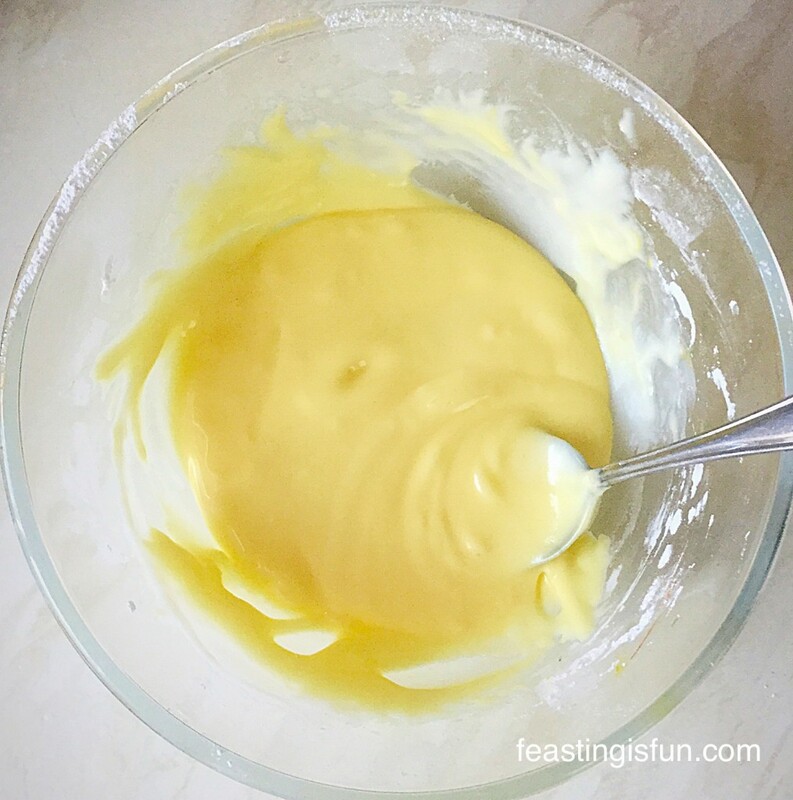 Add one third of the dry ingredients and two eggs to the creamed butter and sugar, whilst whisking/beating on a slow speed. Add two thirds of the blueberries to the batter, the zest of two lemons, one egg and the final third of the dry ingredients. Whisk/beat on a slow speed until just combined. 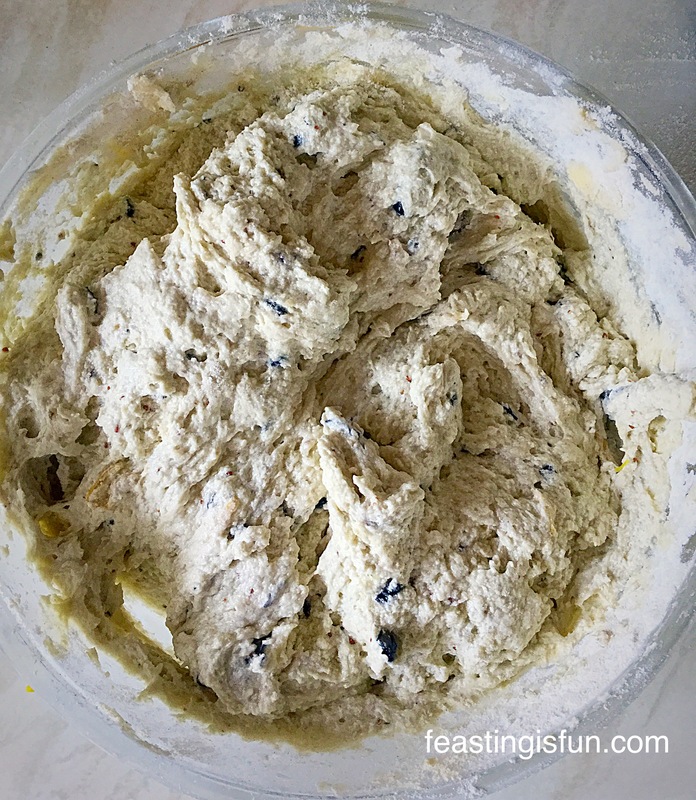 The cake batter should be smooth with broken up blueberries throughout. Prepare the Bundt tin by spraying well with Cake Release, or brush with melted butter, ensuring you completely cover all the groves in the pan – then add 2tbsp of plain white flour and rotate the tin ensuring the entire inside has a flour coating. Tip any excess flour out of the tin and dispose. My Blossom Bundt Tin prepared with cake release spray. Spoon the cake batter into the Bundt tin, pressing down as you do so to ensure the batter fills all the little dips and grooves. Only fill the Bundt tin 3/4 full. Any excess batter can be baked as cupcakes once the main cake is cooked. 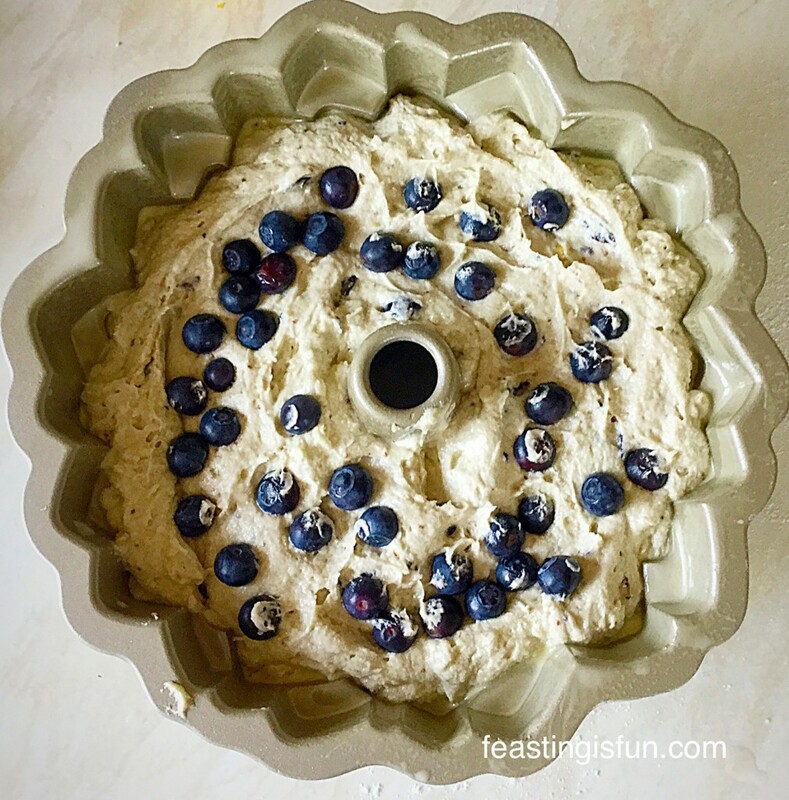 Press the remaining third of the blueberries into the top of the cake. 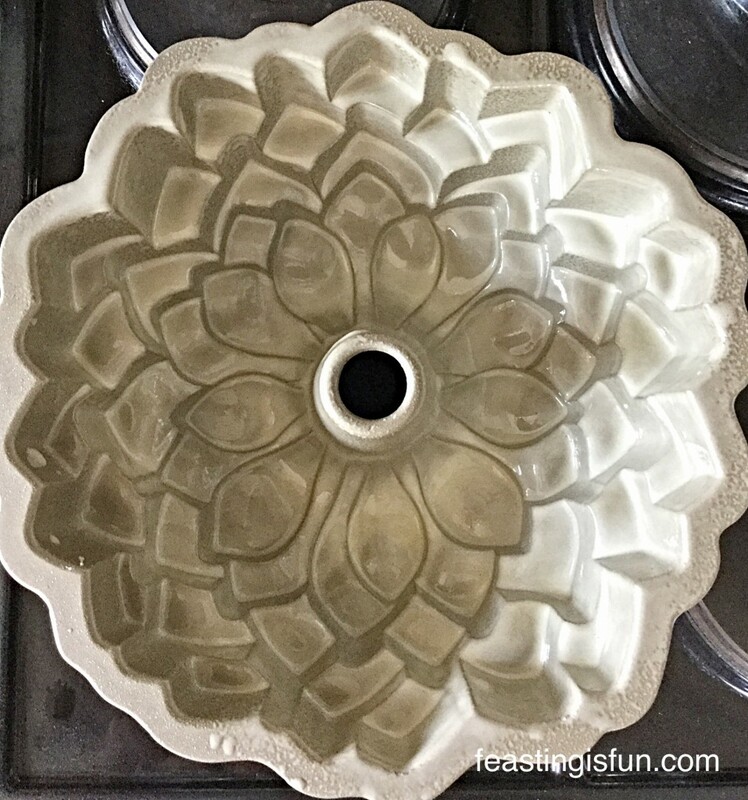 Place the Bundt tin into the middle of the preheated oven. Bake for 1 hour, or until an inserted wooden skewer comes out clean. As soon as the cake is baked remove from the oven. 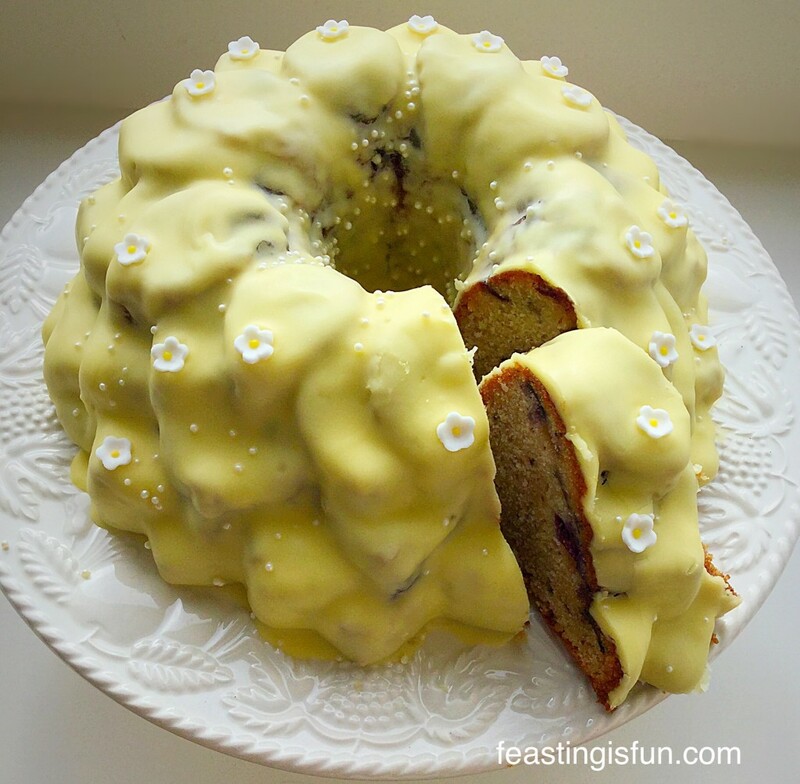 Allow the Lemon Blueberry Bundt Cake to cool in it’s tin for 10 minutes. After 10 minutes turn the Lemon Blueberry Bundt Cake out onto a cooling rack. See how beautiful this cake is? A light dusting of icing sugar and this Lemon Blueberry Bundt Cake would be perfect to serve alongside a nice, hot cup of tea or coffee. Ensure the cake is completely cold before icing. Add the lemon juice and stir thoroughly to form a very thick paste – additional water can be added. 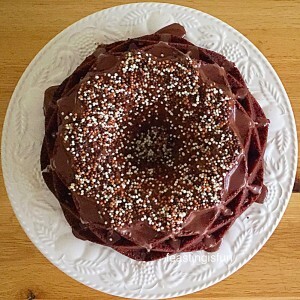 The icing should hold a figure 8 for a few seconds. Using a cocktail stick add a tiny amount of yellow gel icing, mix thoroughly, add more colouring until the desired colour is achieved. Mine really was the consistency and thickness of really good custard. 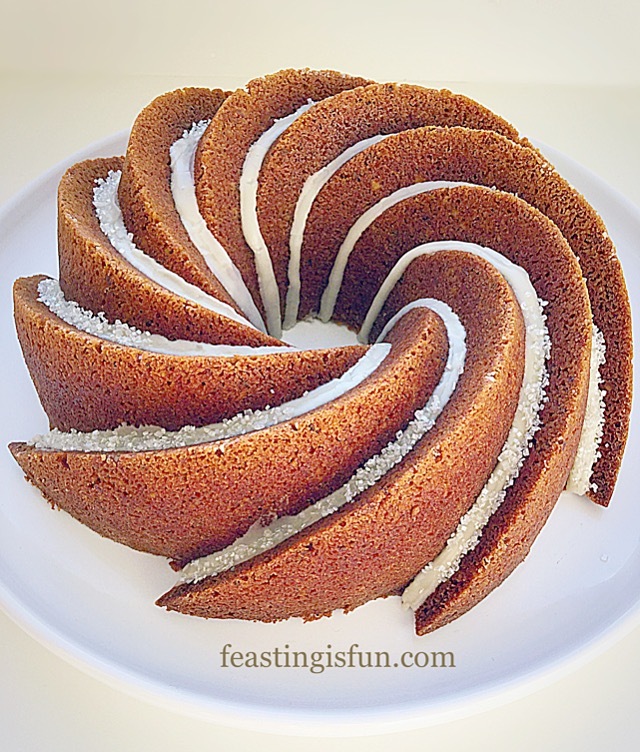 Place the Bundt cake on a rack over a tray – I used a roasting tin, as you will see. 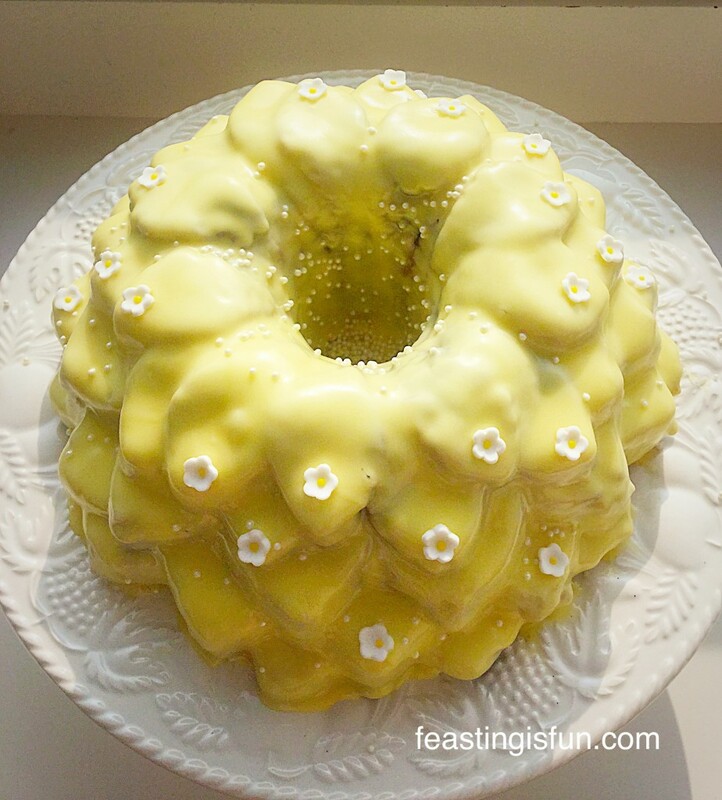 Yellow, lemon flavoured, thick icing. Carefully spoon the thick, lemon icing over the cake. Starting at the top of the cake, spoon over the thick icing evenly. Allow gravity to work and let the icing slowly drip down the cake. Fill in gaps with more icing until the whole cake is completely covered. 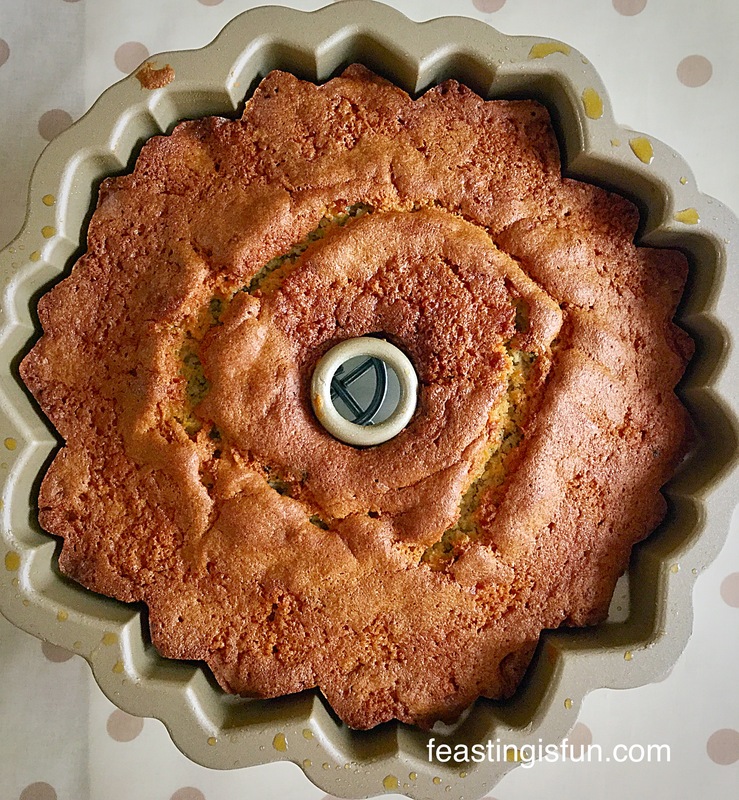 I did spoon some of the icing, from the tray underneath, back over the cake to fill in gaps – just beware of cake crumbs! As soon as the cake is completely covered and has settled – the icing is no longer moving – carefully place the cake onto a board/cake stand. Add any further decorations whilst the icing is still slightly wet. Set the cake aside to dry. 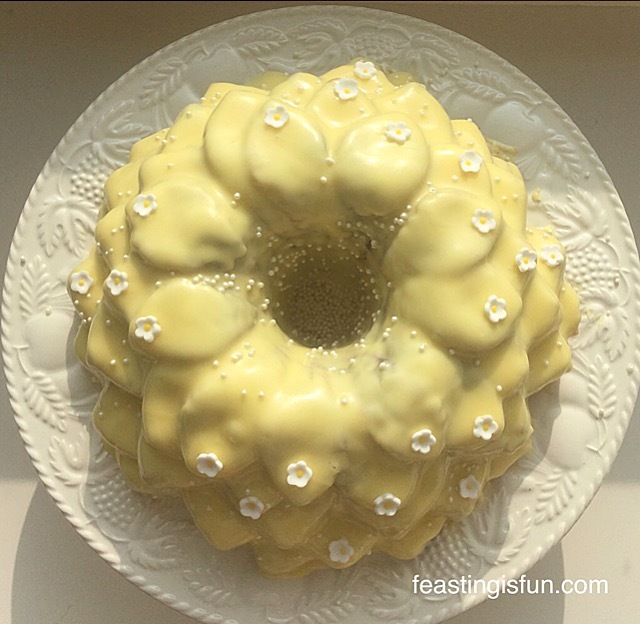 Take lots of photographs and give yourself a big pat on the back for creating such a beautiful Lemon Blueberry Bundt Cake. 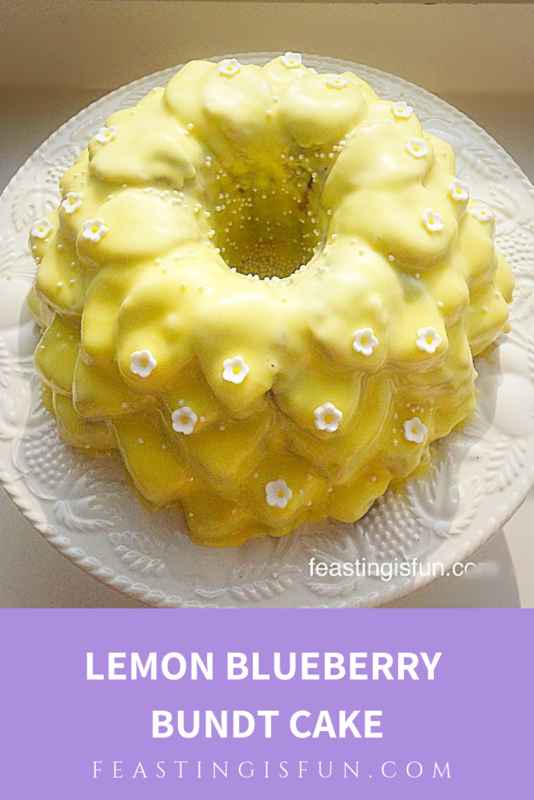 Lemon Blueberry Bundt Cake covered in a delicious lemon glaze. This Lemon Blueberry Bundt Cake is certain to cheer up anybody’s day and they get a vitamin C boost as well! While it may sound silly, looking at this cake really makes me smile. Also, in some ways it is a reflection of my personality, sunny whatever the weather. Since I have discovered Bundt pans I have added more and more to my collection. When I bake with them I know that the cake will turn out beautiful. And if I’m not able to decorate the cake I am assured that it will look finished. As a result I am a firm Nordicware Bundt Pan fan! So whatever you are making, baking and creating, have fun preparing and sharing your feast. Hi everyone, Spring Has Sprung finally. The Daffodils are filling gardens and hedgerows with sunshine, even on the dullest, chilliest days. 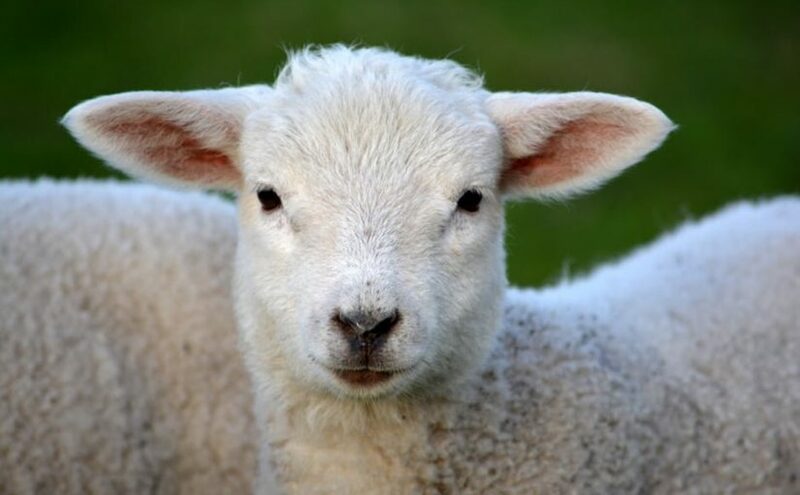 Newborn lambs are gambolling about in the fields, snow white and bleating for their mummies. Snowdrops the first flowers to push through as Winter passes. Spring is truly the Season of hope. Winter’s icy claws fight with the rising sun, whose warmth and light is needed more than we’d remembered. The noisy chattering of Sparrows, in their happy little communities, only broken through by the song of a Blackbird. Morning truly has broken when you hear Blackbirds singing. Chicks a reminder of new life. Spring, with it’s promise of new life. Blossom refusing to obey the flat grey clouds, springs from the trees, once spent, will create Natures greatest show of confetti. Pink and white petals, flutter down, covering the ground like colourful snow. 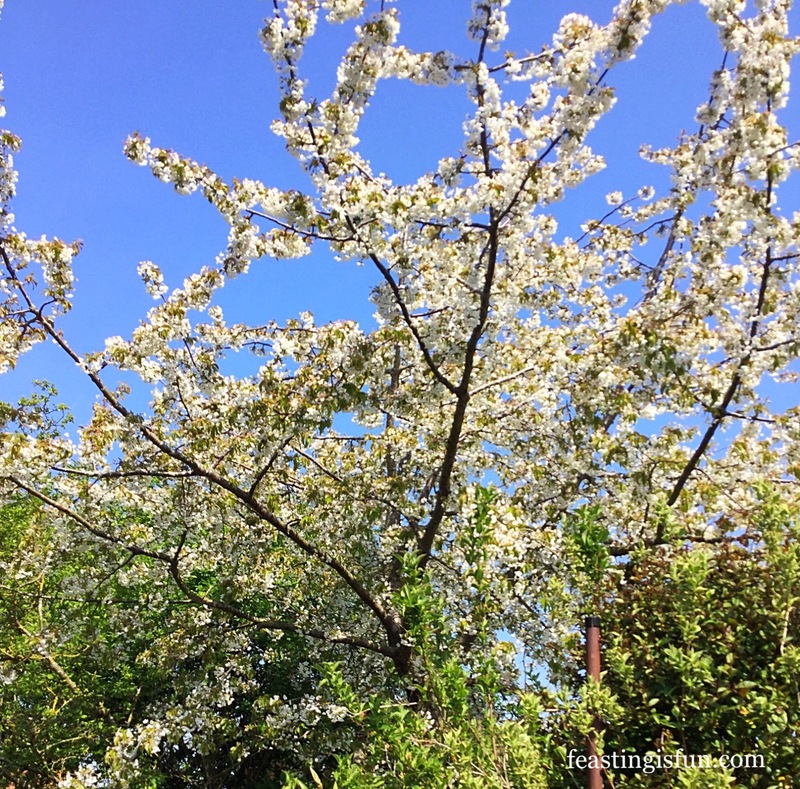 Our Cherry Tree in full blossom. Winter is behind and the long, scorching days of Summer lay ahead. Treasure every day. Each new bud that turns stark landscapes to vibrant green. Yes Spring for me is truly the season of Hope. Easter, a prominent reminder, that what was dead, can indeed break the shackles of darkness and live again. Christ who gave His all on the Cross, the ultimate reminder, that when He arose from Death to Life, that we too, can have new life in Him. 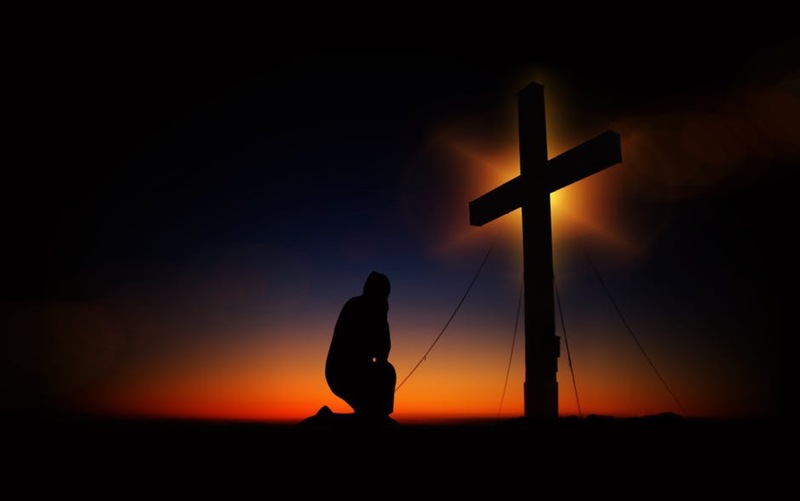 A man kneeling before an empty cross. A sign that Jesus died and then rose again on the third day. Kneeling at the cross where forgiveness is found. Yes Spring Has Sprung, grab hold of the Hope and New Life it offers. 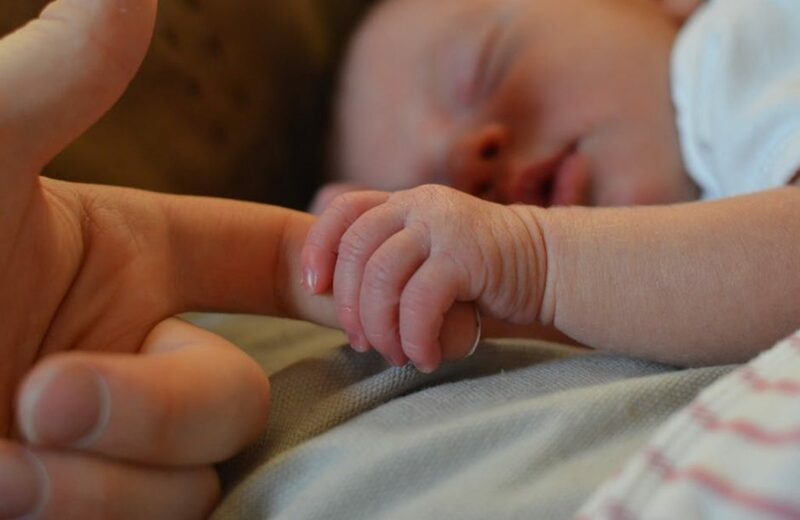 Take delight in the sounds of new birth. For One is crying out louder than all others “Come unto me, you weary and heavy laden and I shall give you rest?”. Never forget that you are a child of God. 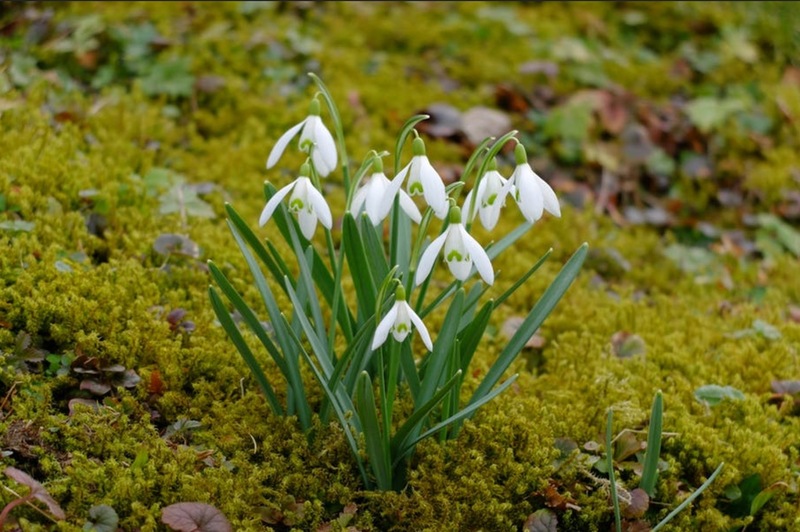 What does Spring hold for you?